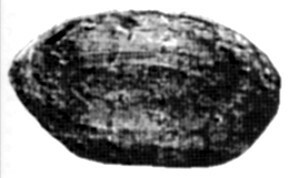 In 1926, John Baxter, one of the quarrymen who regularly supplied Ipswich archaeologist James Reid Moir (1879-1944) with interesting discoveries, uncovered a particularly unusual egg-shaped object from below the Red Crag deposits at Bramford (Suffolk, England). He is usually described by Bad Archaeologists as Reid Moir’s “assistant”, but in Moir’s publications he is consistently referred to as a “quarryman” or “trained excavator”. Reid Moir was a passionate believer in eoliths, supposedly extremely ancient stone artefacts (he termed them pre-Palaeolithic! ), and was convinced that numerous artefacts could be found in these Tertiary deposits. Nevertheless, he seems to have paid this object little attention and it was not until a visit by Abbé Henri Breuil (1877-1961) in 1929 that his attention was drawn to it by his visitor. After examining the object with a hand lens, Breuil became convinced that striations on it were evidence for its manufacture, believing it to be comparable with New Caledonian sling-stones. The photograph (published by Reid Moir in Man 29), is too poor to make out any but the most obvious striations on the surface of the object. It has to be said that they do not look much like the marks of shaping, but as Abbé Breuil examined the object at first hand and was convinced that they were artficial, his authority must carry great weight. However, such striations are well known on stones and boulders moved by glacial or water action. As the Red Crag deposits date from the Gelasian chrono-stratigraphic phase, 2,588,000 to 1,806,000 years ago during the earliest phase of the Lower Pleistocene, when this part of Britain was under a shallow sea, and it seems most likely that the “sling-stone” is a simple case of misidentification, its natural grooves being mistaken for human manufacture by an expert who was overtaken by his colleague’s enthusiasm for finding objects in the deposit in question. Where is the stone nowadays? And did anyone else examine it after Abbé Breuil? If so, what did they conclude? I’m not aware of anyone examining the stone since Breuil. It’s not uncommon for glacial erratics to have parallel grooves on them (they are sometimes referred to as “tracked stones”). As the Red Crags is a glacially derived deposit, this seems to me to be the most likely explanation for this stone.